I took this photo of a chiselled mark in stonework ten years ago, on a wander through the Aldwark area. I’d first noticed a similar one on the bridge over the railway line on Crichton Avenue. These are bench marks, I discovered later. Like the iron signs on the previous page, these aren’t just a York thing, they’re a countrywide thing. They’re also, I suspect, a generally unappreciated and overlooked thing, so I thought I’d big them up a bit. 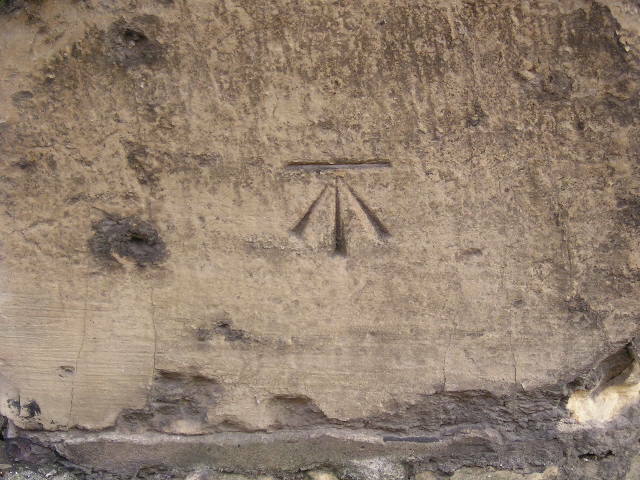 A few years ago a website was set up to record the York bench marks but appears to have been abandoned, perhaps when the scale of the task became clear. A quick search of the database at www.bench-marks.org.uk shows how many of them remain. Here’s the results for just one part of York. Cut Bench Mark — By far the most common type. Used and made from the 1800s to around 20 years ago. You won’t have to walk (or drive) very far in any village, town or city in Britain before you spot one of these. Chiseled into stone, brick or wood on all sorts of vertical structures. A familiar horizontal levelling line with a three line arrow pointing towards it (usually upwards). Each one is unique depending on the mason who cut it, some are plain, some decorated. Some roughly cut, some exquisitely cut with high accuracy. Some small, some huge. ‘Each one is unique depending on the mason who cut it’. It’s the enthusiasts/experts who can see the uniqueness the rest of us probably wouldn’t notice at all. Cut Bench Mark with Bolt — Old and rare these have a metal bolt screwed either alongside the horizontal cut of a cut bench mark or at the point of the cut arrowhead. Usually has what appears as a screwhead horizontal in the head of the bolt. These are highly prized by benchmarkers. Obliteration by erosion looks unlikely to happen for some time yet on the deeply chiseled examples shown above. But my quick search on the database mentioned above brought up one street name where I knew the bench mark would be gone: Dundas Street. Part of the Hungate redevelopment site, and cleared some years back. 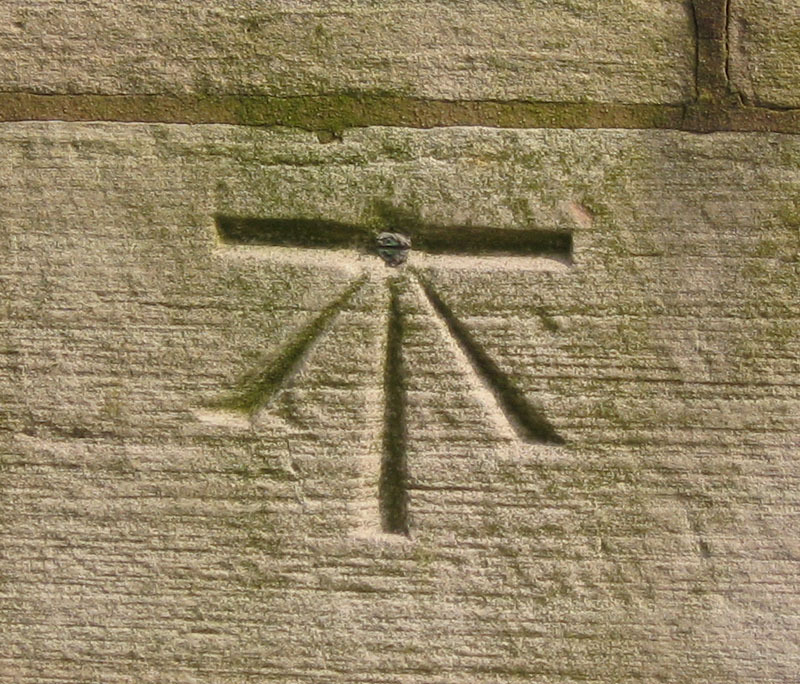 If you notice others on your local wanders, whether in York or anywhere else, might be nice to take a quick photo of the mark and the building it’s on. Really so quick and easy to take a photo, isn’t it. Anyone can do it. Could most of us chisel a bench mark? No. By Lisa @YorkStories • 4 November 2014 Details, Signs and symbols To link to this page's proper location please use the > permalink. I love spotting benchmarks. The one you mentioned on Dundas Street, on the former ambulance station, was the reference point used for all the levels on the Hungate project! I love that a humble chisel mark or three made such a huge contribution to archaeology!